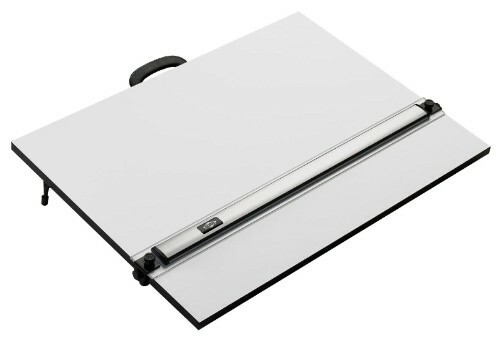 TheAlvin's PXB Portable Drawing Board has been improved and upgraded. PXB provides theconvenience of a studio work surface in a compact, portable unit with arugged, attractive, warp-free white Melamine® laminate surfacethat offers a smooth, clean drawing surface... anywhere you work. Thebrushed aluminum finish of the straightedge provides a stain-resistantpressure point. Each board is equipped with spring-loaded hardware toaccommodate paper, vellum or cardboard. Tractor feet make it easy toset up on any flat surface. The raised reinforcing bar serves as aconvenient pencil ledge, and the parallel straightedge eliminates theneed for T-square. The smooth action pulley moves easily, yet isprecise. Precision-made acrylic straightedge eliminates the need for a T-squareand includes an inking edge for clean, smudge-free results with pens,pencils and markers. Non-slip rubber "Grip-Track" feet on the underside of the board allowthe PXB to overhang the table edge at the perfect drawing anglebringing the work surface closer to you. Foldaway back legs with rubber feet are extremely durable and enableyou to use the board in either the flat or angled position. Warp-free white Melamine® laminated board offers a smoothdrawing surface that wipes clean with a damp cloth . Comfortable carrying handle for convenient portability. Compact for easy storage out of the way. 92 points will be rewarded when you are logged in to your account and buy this item.